The driver of the motorbike, who died en route to hospital, was not wearing a helmet at the time of the accident. PHUKET: -- Two men died and one was seriously injured in Phuket this morning in a single-vehicle motorbike crash after the driver swerved to avoid a utility pole blocking the road in Mai Khao. Tah Chat Chai Police received the report at about 5am and arrived at the scene, about 100 meters from the Holiday Inn hotel, along with Kusoldharm rescue workers, Thalang Hospital officers and Tambon Administration Organization (OrBorTor) officers. At the scene, the rescue workers found Nimit Saengo, 21, dead and two injured men. Nearby was a white Honda Dream motorbike that had crashed into a short retaining wall. The two injured men, Surat Inthapla, 32, and Surapong Kaewthavorn, 23, were rushed to Thalang Hospital. Mr Surapong, the driver, died en route. Mr Surat was later transferred to the better equipped Vachira Hospital Phuket due to the seriousness of his injuries. An initial police investigation revealed that all three men worked for the Mai Khao Dream Company, which operates the Maikhao Dream Villa Resort & Spa. The men were returning to a staff dormitory at the time of the accident. Rescue workers noted that none of the men had been wearing helmets. No helmet = no common sense = no hope = tragedy. You missed 3 adults on a bike. Small hours of the morning ? Draw your own conclusion. Yes it is a tragic waste of lives. RIP. Only 3 on the one bike, they'll probably find 1 or 2 more in the bushes as rot sets in. Hadn't missed that, just didn't say it. Also didn't miss that they can't have been driving at a sensible speed not to have seen a bloody great obstacle in the road such as a utilty pole in adequate time to take evasive action. A tragic waste of lives, I totally agree. Until we see proper driver education and enforcement of laws out here, it's a tragedy that will be played out time and time again. RIP. My condolences to the family, friends and co-workers of the deceased and injured. 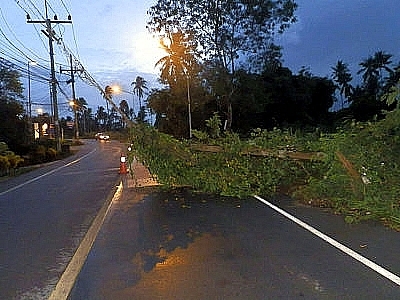 "...the driver swerved to avoid a power pole blocking the road. " Why was there a pole blocking the road? Look at all the foliage on the line. Weight dragged it over. Plus these poles are just plopped into a shallow hole with little or no concrete anchor. See it all the time. A good reminder of an important principle of motorcycle riding. Don't outrun your sight-line, or, if at night, don't outrun your headlight. Meaning you should never be traveling at a speed great than that which allows you to safely stop, or at least avoid, any stationary hazard that "suddenly appears" ahead in the roadway. Lost on the Thai's, it's a good practice for those of thus that actually care about the safety in our riding. Darwin might be dead but his theories live on. Further proof here. There are some that just don't get it no matter how hard you try to help. Totally irrelevant Scott. If you cant drive to the conditions that may exist at the time, you shouldn't be driving at all. It looked to me in the photo to be well marked with traffic cones. Any sensible driver would have missed it. Probably finished work at 12 pm, on the piss until 4.30 am. ....pop a few pills.............. that's the way I see it. Can some one get a police report to refute my theories, no I thought not.